we have been contributing since 1992 in the field of Management System Certification, Personal Certification, and Product Certification services. We have already spread our services in 33 countries. UASL has been established to provide services to any part of the world and would be inviting applications worldwide. Accreditation by UASL demonstrates the competence and independence of these CABs in the field of accreditation. UASL accredits CABs who in turn certify organizations. UASL has been a persistent pioneer in the field of accreditation, well known and respected for its combination of innovative and user-friendly business acumen and its respect for the vigorous maintenance of integrity and impartiality that is the hallmark of the quality assurance profession. 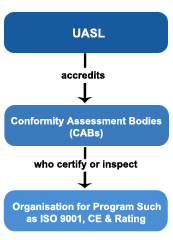 UASL has pioneered conformity assessment body (CAB), through its performance. Our accreditation reporting permits us to monitor the performance of CABs year on year and provides us the ability to determine, in detail, the manner in which CABs are attaining the levels of excellence we demand. Accreditation by an independent authority means that when you choose a certification body to review your activities you are choosing someone who has been reviewed against defined standards. You will know that they have their own documented operating system and procedures for looking after your interests. You know that accreditation by UASL has provided a level of assurance and recourse that is not normally available to business. All organizations certificated by UASL accredited organizations may be independently verified and their current certification status checked Certified organization. UASL is a company registered in England and Wales (No. 08283067).